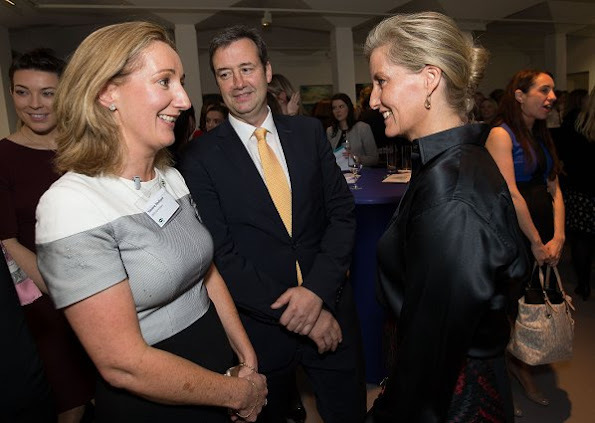 The Earl and Countess of Wessex is visiting Dublin for a number of engagements. 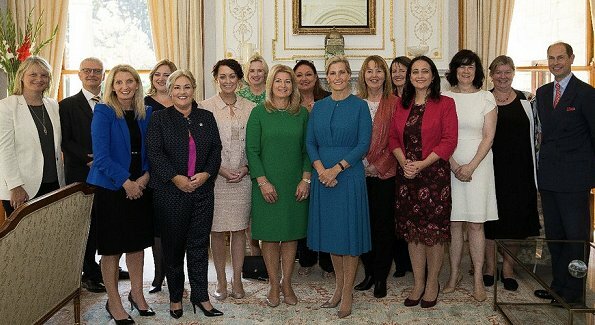 On the first day of their visit, The Earl and Countess of Wessex hosted a lunch for women leaders at Glencairn House, the residence of the British Ambassador. 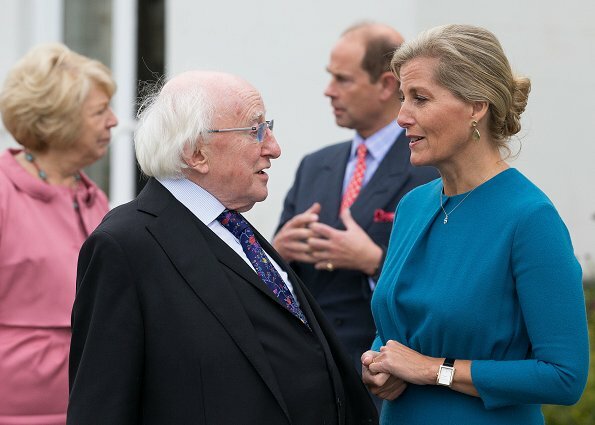 Afterwards, The Earl and Countess of Wessex visited Irish President Michael D Higgins and his wife Sabras Higgins at the presidential residence. 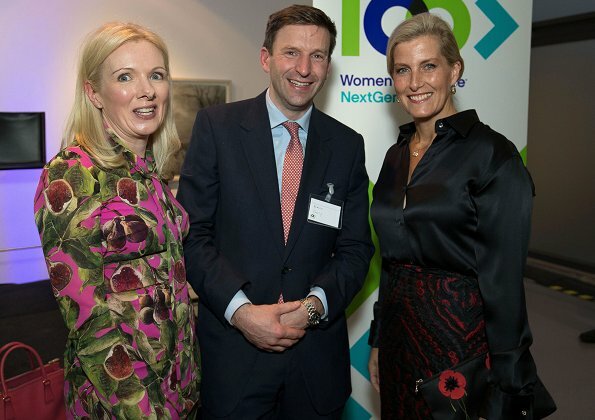 Then, The Countess of Wessex visited Royal Hibernian Academy for the launch of 100 Women In Finance NextGen Dublin. 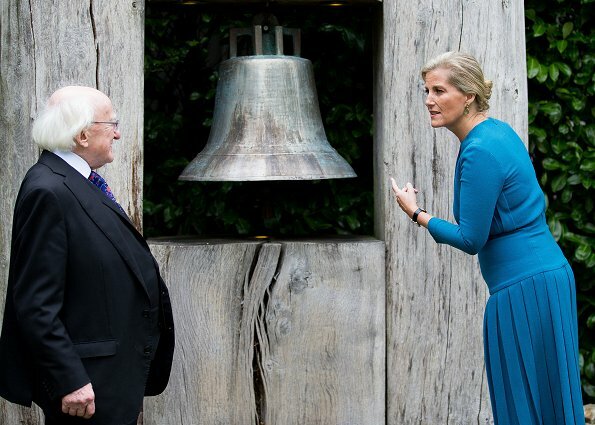 Love that color, would love to have that dress myself. Big mistake with the black blouse and skirt. I love how Sophie steals the spotlight! Excellent outfits in both events.She looks elegant and happy. I don't like this dress, but the color is nice. The blue dress is a wonderful color, length, and fit for her and she looks quite comfortable in it. On the other hand, the black and red outfit just doesn't suit her at all. It is too long on her and that harsh color does her no favors. For me, this white coat is much preferable to the other one from a few days ago. 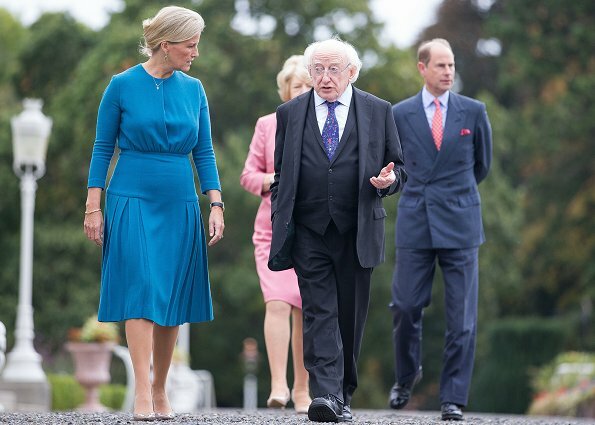 That coat had dropped shoulders, was too big, and was baggy everywhere. The fit on this one is better especially at the shoulders and sleeve length. 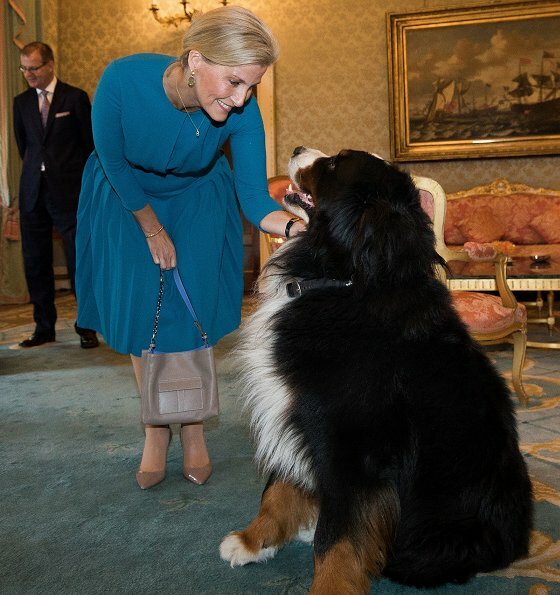 The blue dress is a good color for Sophie. I think the lower part of the dress is too full and matronly looking. Love the black blouse and black/red skirt, more daring and modern looking. 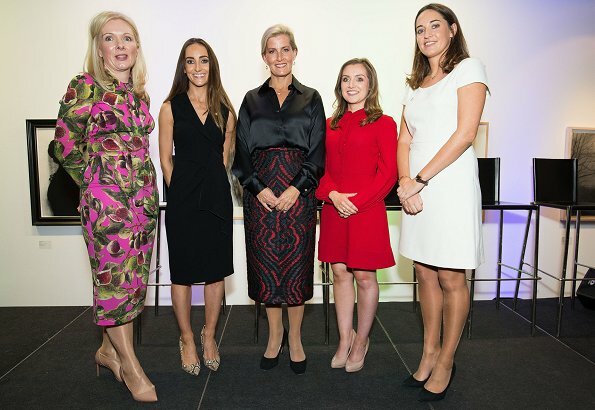 Sophie proves here that yes, blondes can wear black and look fabulous! Doggie is the winner here. I think she needs help with her hair. It looks okay when she first rolls it, but begins to fall down after a while. Then it looks sloppy. The coat is Burberry, so of course it is fabulous, and the color suits her. The blue dress bothers me in the mid-section. I wish it wasn't fitted across her stomach. It would have looked more flattering if the skirt released from the waist. 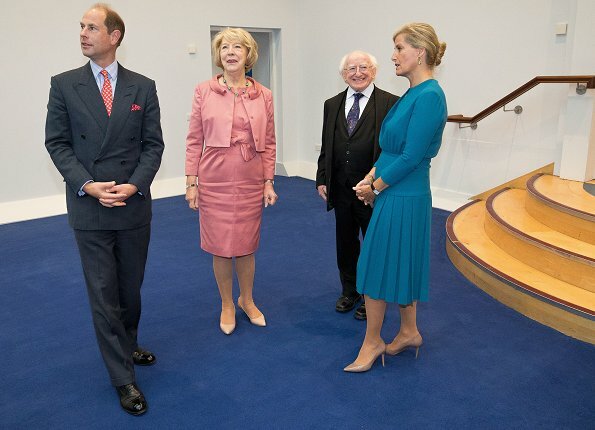 I agree about that blue dress's skirt - wish I had included that in my first remark. You need to be super-slim to wear that style skirt. She isn't fat, just average. 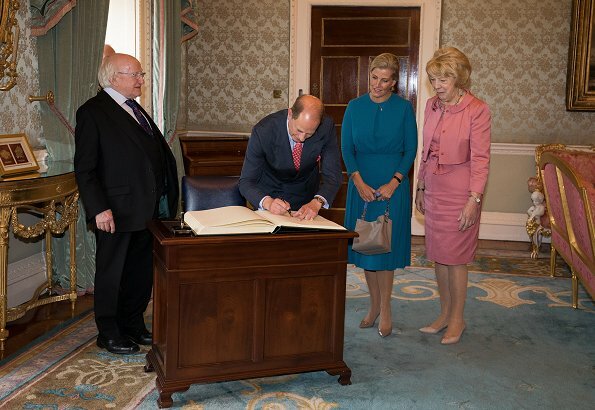 The blue dress is a great colour, but I dislike the waist detailing. 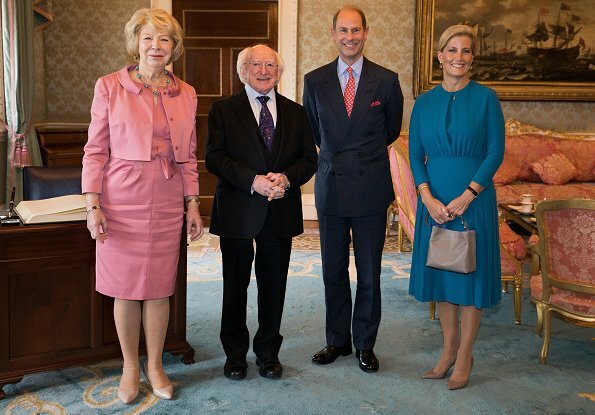 I am glad she didn't wear green, not only do I think it is tacky when royals dress in 'national' colors while on tour, but there is another lady in the pic that was wearing solid green. 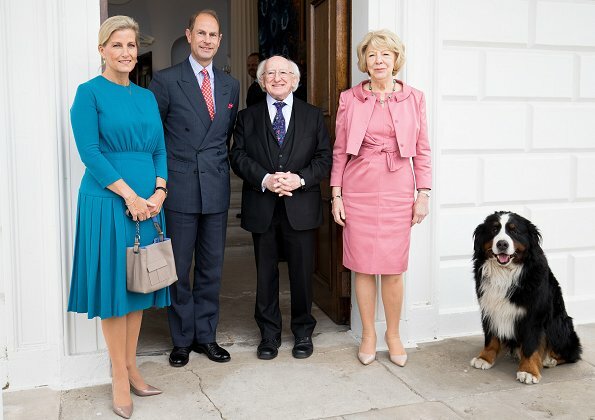 The Irish 'First Dogs' are so adorable! The black and red skirt is not a winner, like the color of the blue dress. Wonder where the other dog is?.